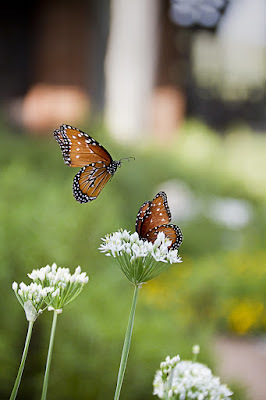 Yesterday we uploaded a photo to Facebook of a pair of Queen butterflies floating around the grounds at the Inn Above Onion Creek bed and breakfast. Today we managed to get another nice shot of a couple more feeding on the nectar of some chive flowers. Onions, Chives & Garlic do wonderful in a Fall garden in the Texas hill country.